To usher in our upcoming knits pattern (due out October 20th), we put together a short series of videos all about shopping for knit fabrics. In this first video, I talk all about fabric terms. If you’re used to wovens and aren’t really sure what some of those knit fabric recommendations for patterns mean, click the image above to go to the video page. 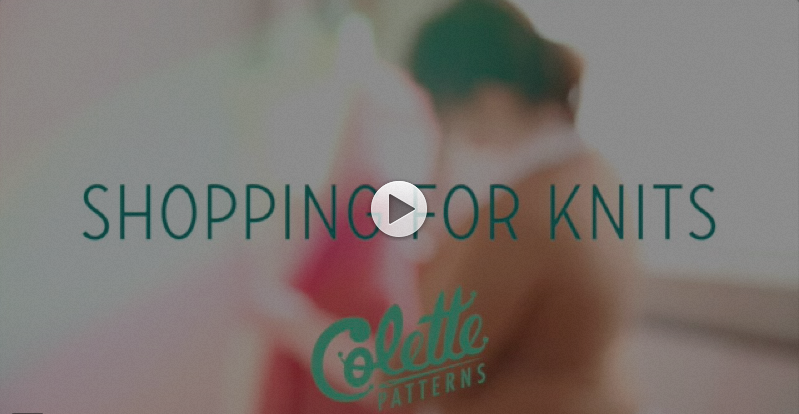 As I was writing this video, I referred constantly to Alyson’s book, The Colette Guide to Sewing Knits. After you watch the video, sign up to get the chapter from the book all about fabric for free. It’s a nice little reference to go along with the information in the video. There’s even a really handy fabric chart that includes all the fabrics I talk about. We’ll also let you know when the next video in the series is up. That one is all about what qualities you should actually look for in knit fabric when you’re at the store (or looking over swatches, or your own stash). What special notions do you use with knits? Join me for a (free) online fabric talk! Reminder: My online fabric talk tomorrow! I love this video, sure wish I had access to something like it when I first started playing with knits! Being able to see the fabric drape as you move it makes the differences so much clearer. I really appreciate the explanations of the terms too. Thank you! Thank you for this series! I found this first video very helpful. With so many pretty fabrics available to buy online it will help to understand the terms so I feel more confident about what I will be getting if I purchase them. I noticed some pretty knit fabrics at the store recently but when I touched them I thought they felt “yucky” and I would not want to wear them, pretty or not. Looking forward to the rest of the videos. Thanks again!! What a great video!! You really got me when you suggested comparing my fabric stash with my closet. I’ve been sewing for decades, but I’ve almost never made anything from knit fabric because I’ve been so afraid of it. Now, I can’t wait to try out some things. And I’m really looking forward to the next videos. Loved this video and can’t wait to see the new pattern. I’m a beginner, having only made the Zeena skirt so far. Looking forward to starting on knits. Yup, it was a merino jersey from The Fabric Store in Los Angeles! how perfect, I live in LA! Thanks! Super helpful and so timely, as I am planning a sewing project and tossing around the idea of using French lace or lightweight sweater knit fabrics. Thank you! Thanks for the video. Will you be showing knit interfacing? I just discovered it (not easy to find but can be ordered on line, although I found both black and white at Mary Jane’s in Charlotte, NC). It works great on wovens too, giving just enough body and no stiffness. We’ll mention it in the final video on notions! I love knit interfacing, I use it all the time with wovens too.